Nine Hall-of-Famers, seven games, and the greatest home-run hitter of all time; this is what the 1957 World Series brought to the table for all to see, and it didn't disappoint. In a series that was won by a team other than one of the three New York franchises, for the first time in nine seasons, it came down to a gutsy victory on the road to take home the title of champion. 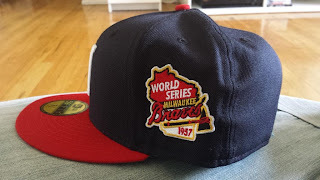 The Braves had just recently moved from Boston to Milwaukee, hadn't captured a National League Pennant in ten seasons, and had six name changes over the course of the prior 70 seasons; needless to say, a tradition of winning wasn't exactly in their heritage. After only losing the NL Pennant by one game in the previous season, Milwaukee certainly had their work cut out for them against the seemingly immortal New York Yankees. Thanks to the offensive prowess of a then 23 year-old, National League MVP, Hank Aaron, three victories in the series by pitcher Lew Burdette, and a relentless line-up featuring players the likes of Eddie Mathews and Frank Torre, the Braves were able to seal the series victory, in seven. That amazing feat has inspired this recent release from http://www.ecapcity.com/. Although the World Series side-patch didn't make it's way onto New Era on-field caps until the mid-90's, this is an authentic logo used on programs and other merchandise, thus being an accurate visualization of what it would have looked like. 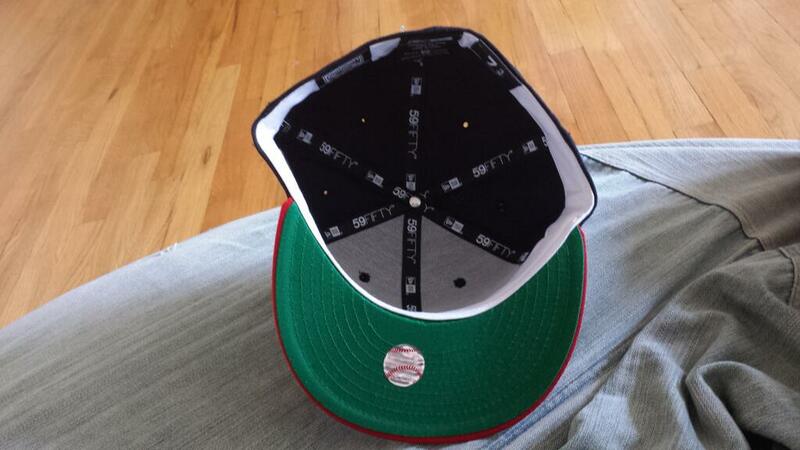 Along with the fore mentioned side-patch, the cap featured above has a red brim, navy crown, capital "M" front and center, a period correct green under-brim, and the accurate absence of MLB Logo on the reverse. If you're interested in this cap, it can be found HERE. If it seems like something you'd like to add, I'd suggest buying it quickly before it's gone forever.